Four teachers and 12 students attended the 2016 Quiet Lion Tour to Thailand. The tour is named in honour of Sir Edward "Weary" Dunlop. The students visited cultural icons of Thailand. The students on the tour were accompanied by former Prisoners of War of the Thai-Burma Railway. Students honoured the war dead by attending the dawn service at Hellfire Pass on ANZAC Day. Students also attended the morning service at Kanchanaburi War Cemetery where they laid a wreath on behalf of Esperance SHS and the Esperance RSL in honour of Ernie Redman OAM. 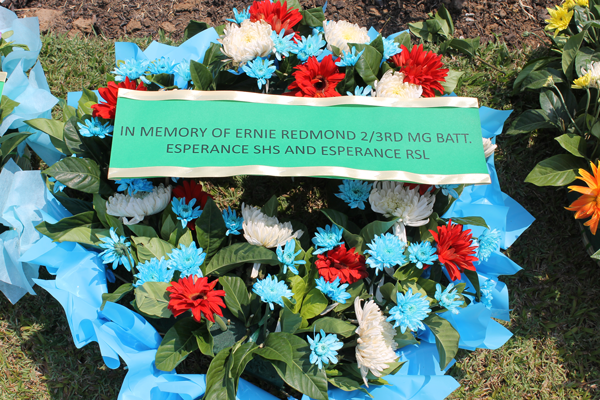 Ernie was an honorary Esperance SHS staff member. Ernie was a former Prisoner of War. He accompanied numerous students on the Quiet Lion Tour and is remembered with great fondness.